This weekend we were able to As both introduce the fantastic song, Reckless Love, to our church community and continue our “More Than Happy” theme by telling an amazing story of redemption and wrapping it within the lyrics of this powerful song. This highlights a couple techniques we employ often to maximize impact. Introduce a new worship chorus by using it in special way that allows people to just experience and absorb. This gives us the ability to even highlight the lyrics of the song and even weigh response before it becomes part of our regular rotation. We call this “The Weave”. In this case, we bookended the video story of Krista with the song. It prepared people for what they were about to hear and then put an appropriate period on her story. Krista’s story also encompassed one of our close local partners Refuge for Women, which serves as a transition home/program for ladies escaping the horror of human trafficking. Located right in Las Vegas, we are humbled to stand alongside their work providing resources and volunteers. This was an extra subtle bonus of presenting her story. Sometimes your plan collides with the world in ways you could never HAVE planned. The week prior to this service a terrorist shooting took place in San Bernardino, CA that shocked all of us. This song had already been planned in the service as our theme was “Judgment”. Little did we know this song would have such a powerful impact based on the events and emotions of the moment. What a great weekend we had at The Crossing! Our main text for this weekend was 2 Timothy 2. Shane Philip, our senior pastor, talked about the importance of living a life that can be an example for others. There were a couple creative elements that we used that were very strong. We found a very good video on YouTube that featured Bryan Clay who is the Olympic Gold & Silver Medalist in the Decathlon. This video on YouTube is in 5 different parts. We played 3 of the 5 parts in the service and it made for a great tie into the message. 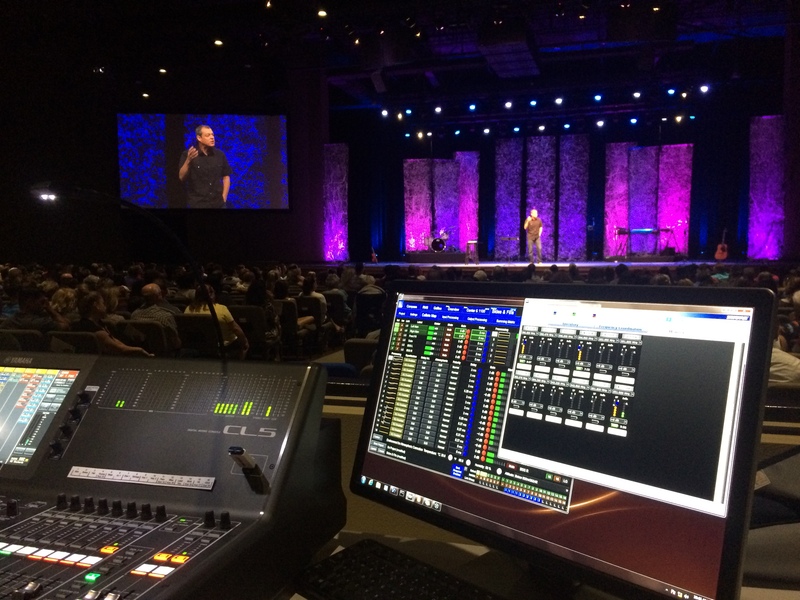 We enjoy being able to use a story at the beginning of the service and followup the story at the end of the message. This video allowed us to end cap the “Message Elements” section of the service to link everything together. The service flow below shows how we did that this weekend. We did a feature song originally performed by Rascal Flatts called “Stand.” This was a great song that was an awesome addition to the service. During “Truth is Stranger Than Fiction” we spent a week on the Valley of the Dry Bones in Ezekiel 37. We decided to do rendition of “Awake My Soul” by Chris Tomlin and Lecrae with the spoken word and it turned out great! We were able to do this song pretty much as it was done on the recording and it was a very cool element. We had several conversations about the placement of this song in the service, whether pre-message or post. With the direction that the message it fit really well content wise to go post message, so that it what we did. However, it did not have the feel that we wanted it to have at the end of the message and in hindsight we would have placed the song pre message. 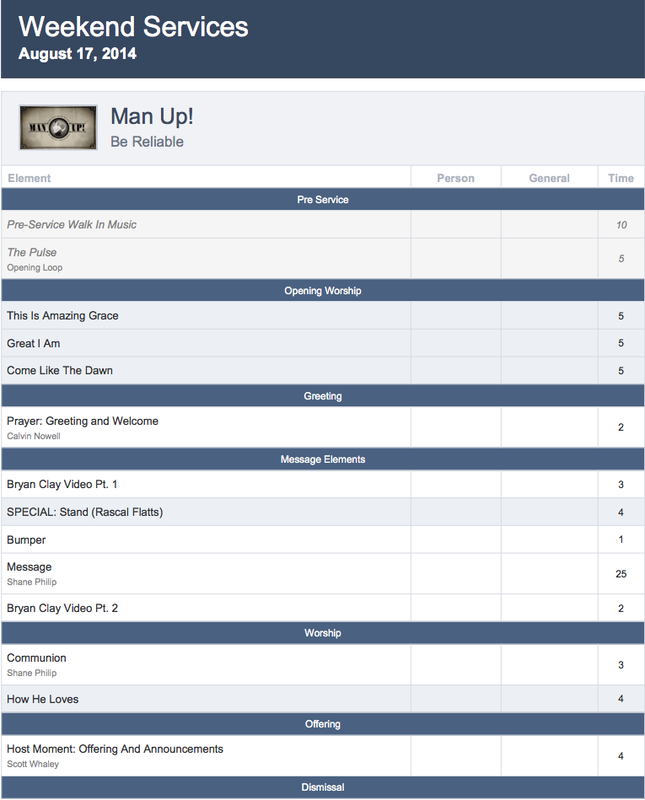 For a few days we tossed around the thought of doing a rendition of “Sad” by Maroon 5 for the first week of our Man Up series – Be Bold, based in 2 Timothy 1. We ended up putting the song back in the idea hopper because it did not quite fit the message and set a different mood than we wanted for that day. Our Music Director changed a couple words in the chorus to help it fit better for a church context. We thought we would include this, even though we didn’t end up using it, in case it works better in your context or it sparks another idea. 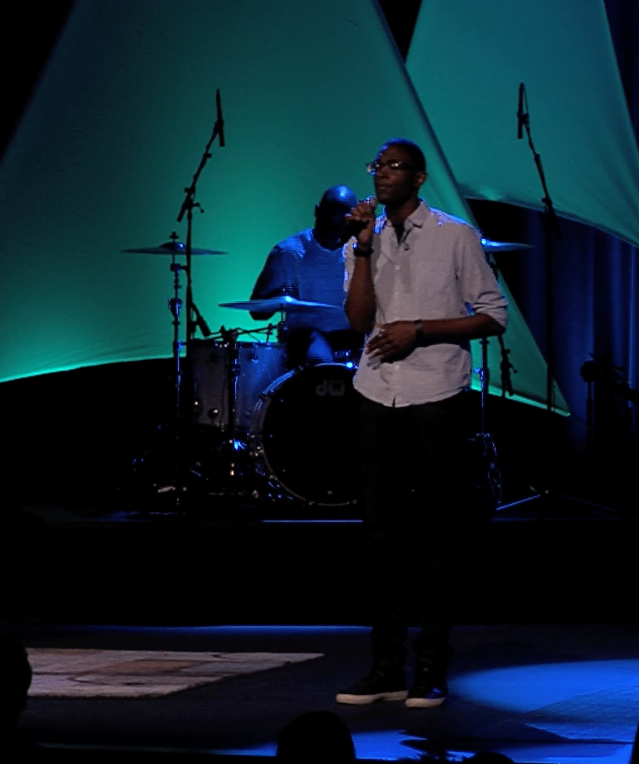 As apart of our Man Up series we did the song, “The Words I Would Say” by Sidewalk Prophets. We felt like the song was the same throughout the entire time, so we scaled it back for a more acoustic sound at the beginning and then built it into full band. To make the staging feel different we put our everyone but the Keyboardist on stools and had all of our guitarist come to the front line and put the vocalists in the back. It was a nice way to mix things up.